Tag line: "Dare you walk these steps again?" Georgetown, 1990. A college rowing team practices in the early morning hours, while miles away, an unseen force breaks through the front door of a church, causing such havoc that the eyes on a Jesus statue, which is hanging from a crucifix, open up wide. Then there’s the dream sequence, in which an unnamed narrator walks a darkened street, then falls down a long flight of stairs. Suddenly, we switch to an ocean view, with several search helicopters flying overhead, a scene enhanced by the inclusion of the now-familiar tune, Tubular Bells. These are a few of the images that dance across the screen during the opening credits of writer / director William Peter Blatty’s The Exorcist III, and what amazed me was that in less than five minutes, this 1990 film was already more intriguing than the entirety of Exorcist II: The Heretic! It’s been 15 years since the exorcism that claimed the life of Father Karras (Jason Miller), and two of his good friends, Police Lt. Kinderman (George C. Scott) and Father Dyer (Ed Flanders), haven’t come to terms with his death. To make matters worse, a killer is on the loose, one who seems to be copying the murders of the Gemini Killer (Brad Dourif), who was executed for his crimes a decade and a half earlier. With no eyewitnesses to the latest killing (a young African American boy is found beheaded) and no real evidence to go on, Kinderman and his associates are baffled, to say the least. Over the course of several days, more people are murdered (including a person very close to Lt. Kinderman), and while investigating the latest killing at a nearby hospital, Kinderman has a conversation with Dr. Temple (Scott Wilson), the head of the facility’s psychiatric unit, who reveals something quite astonishing: a patient currently being held in solitary confinement, who is prone to fits of rage, was first found wandering the beach 15 years ago, with no memory of who he was or how he got there. Not only does this mysterious patient bear a striking resemblance to the late Father Karras, but he also claims that the spirit of the Gemini Killer lives within him, and that he is responsible for the string of recent murders. Lt. Kinderman, whose faith abandoned him years earlier, finds his story impossible to believe, but a meeting with the patient in question quickly changes his mind. 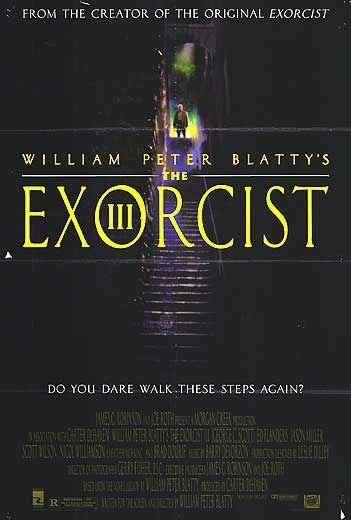 Like most of the world, William Peter Blatty (screenwriter of The Exorcist) was not a fan of Exorcist II: The Heretic (talking years later of how he turned down an early offer to work on the follow-up, Blatty conceded “I wish I’d done it now. Then at least we would have never had The Heretic”). So, to set things right, he published a new novel in 1983 titled Legion, which continued the story set forth in The Exorcist while ignoring everything that happened in its ill-advised 1977 sequel. 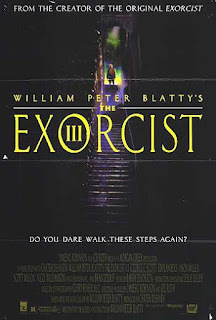 Seven years later, Blatty himself brought it to the screen as The Exorcist III, and even though it doesn’t quite reach the level of greatness that The Exorcist currently rests upon, The Exorcist III does, at times, match the dark tone and ominous mood of the original while also featuring moments of genuine horror. The Exorcist III has a few things going for it, starting with its crisp, believable dialogue (some of the early exchanges between Kinderman and Father Dyer, where they discuss everything from a carp in a bathtub to the mysteries of life and death, are positively engrossing). In addition, the film’s story (though admittedly far-fetched) is well-told, and the performances of its leads are top-notch. No stranger to horror thanks to his turn in 1980’s The Changeling, George C. Scott is tremendous as the grizzled Kinderman, whose doubts about the supernatural are soon answered, while Jason Miller is downright diabolical as the allegedly possessed priest. Yet, for me, the most memorable performance in The Exorcist III is delivered by Brad Dourif, who plays the personification of the Gemini Killer that lives within Father Karras. An actor of immense ability, Dourif has the uncanny ability to scare the hell out of you (his take on the killer doll in Child’s Play helped make that movie, as well as the entire series, what it is). Delivering lines that will chill you to the bone (“A decapitated head can continue to see for approximately twenty seconds”, he tells Kinderman during one of their talks, “So when I have one that's gawking, I always hold it up so that it can see its body. It's a little extra I throw in for no added charge”). In every scene he appears in, Brad Dourif is as fascinating as he is horrifying. Then, of course, there’s the film’s famous jump scare, and let me tell you, it’s a doozy! For me personally, there have been a handful of cinematic jump scares that truly shocked the hell out of me: The jailhouse scene in 1979’s Salem’s Lot; the ending moments of Friday the 13th; the “blood test” in John Carpenter’s The Thing; and the final scene of 1976’s Carrie are but a few. More than just making my list, the moment in question in The Exorcist III ranks towards the top of it! Not to worry: I have no intention of describing it, or telling you where and when it occurs. Those who’ve seen the film already know, and those who haven’t shouldn’t be robbed of the experience. A smart, often intense horror flick, The Exorcist III is an impressively strong sequel, and at some point during a future Halloween season, I recommend watching The Exorcist and The Exorcist III back-to-back in a single sitting. They make for a terrifying one-two punch. As for Exorcist II: The Heretic, save it for April, which is National Humor Month, because compared to the original and Part III, that movie is an absolute joke. Among Blatty's incentives was knowing this time around he could ensure he didn't get screwed over royalties, given Warners' lawyers had somehow proven in court that The Exorcist - then the most successful horror film in history - had actually lost money.